Last week was the most incredible week of my life. As you can imagine, this is going to be one hell of a post so get make a cuppa and get comfy! 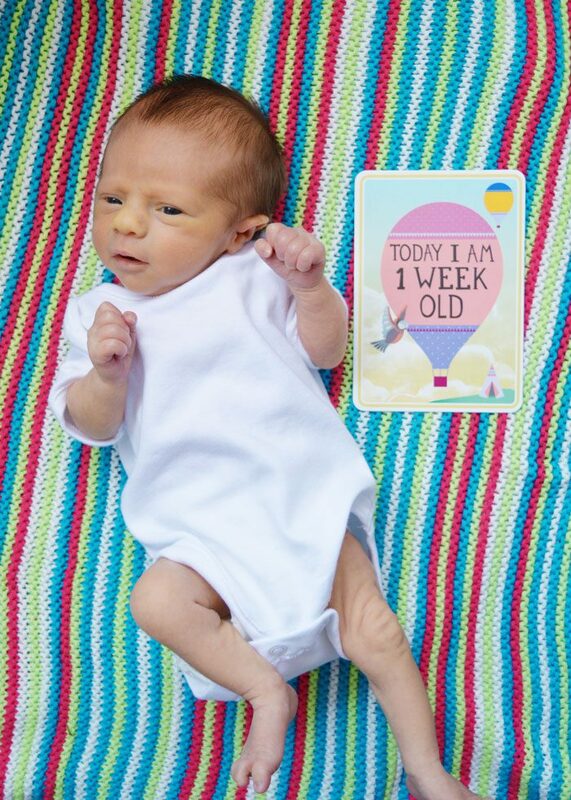 Thank you so much again for all the well wishes after the birth of Finley John last week, hence to say it’s been a bit of a roller coaster. It all started a week last Friday. I’d had my scan the proceeding Monday and a midwife appointment that morning with everything looking perfect in terms of mine and the little one’s health. James and I went to Sainsbury’s for a bit of shopping and while walking round I noticed some period like pains in my lower back. Once we went home they felt a little stronger and I knew then that something wasn’t quite right, especially with the way they’d come and go every few minutes. I called the hospital at 9pm and they told me they were likely braxton hicks practice contractions and I should only worry if baby movement slows down or if I bleed. I managed to sleep for a few hours after listening to my natal hypnotherapy cd, then I woke up and started feeling paranoid about baby movements, then at 4am I went to the bathroom and found some blood so I called the hospital right away and went in for an assessment. The little ones heart beat was fine and I was checked out too. He was in a transverse lie with his head over at my hip and my cervix was fully closed. I was sent home so we decided to pop to Newcastle for breakfast and shopping as planned. I was still feeling these pains and on the way home I said to James that I really felt something wasn’t right here. He made me call the hospital again and they asked me to come back in. I got hooked up to a monitor which again showed the heart beat was fine, this time it was also picking up contractions. I was examined but the doctor couldn’t find my cervix. They told me they didn’t think it was labour, but in case it was I should have a steroid injection which would help the little ones lungs mature. It would involve an overnight stay, which I didn’t want but James and I discussed it and we decided to go ahead. I was given the injection and sent to the other ward to wait it out. My parents came and picked James up and took my car home. While James was away, I felt the pains getting a lot stronger. I tried using some techniques from my Natal Hypnotherapy which helped keep me calm. When he got back I told him to get the midwife and have me examined. I was really feeling the pains in my lower back radiating round to my hips, lower abdomen and legs. The midwife examined me, and let me tell you I cried so hard when she told me I was 6 cm dilated! I felt a lot of mixed emotions at that point, concern for my 5 week premature baby, joy that I would be meeting him soon and happiness that I was not in fact a wimp! I’d only taken paracetamol for the pain up to that point. I was whisked off to the delivery suite at 5pm and got comfortable on a gym ball with James massaging my back. I managed to tell the staff my birth preferences but that I was happy to just make sure my baby was safe above all else. I needed to be monitored with a strap around my middle but I couldn’t stay in one position. I was breathing in gas and air and just trying to hold it together. After some time (I had no concept of time at this point) they said they’d need to monitor the baby via it’s head and that I’d need to lie down. I hadn’t wanted to do that it but it actually turned out to be quite comfortable – well relatively speaking of course! They broke my waters and attached the monitor to the baby. In what felt like a few minutes I had the urge to push. Anyone that’s had a baby will know what that urge to push is like! I had a great doctor and midwife coaching me through it and James was counting me down through the pushes. I really started to feel like I could’t push anymore but the lovely doctor told me they were bringing in the venthouse and how much he knew I wanted a natural delivery so to keep pushing. James told me (through a few tears) he could see the head and I was told I just needed one more push and the baby was out so I gave it all I had. Within moments baby Finley was placed onto my chest! I couldn’t believe I’d done it, he was here and he was healthy. The first thing I noticed was all that gorgeous hair! He was born at 6.51pm weighing 5lb 4. I had some skin to skin before they took him to be checked. James cut the cord as well. I’d sustained a couple of tears down below so had more skin to skin while they stitched me up. 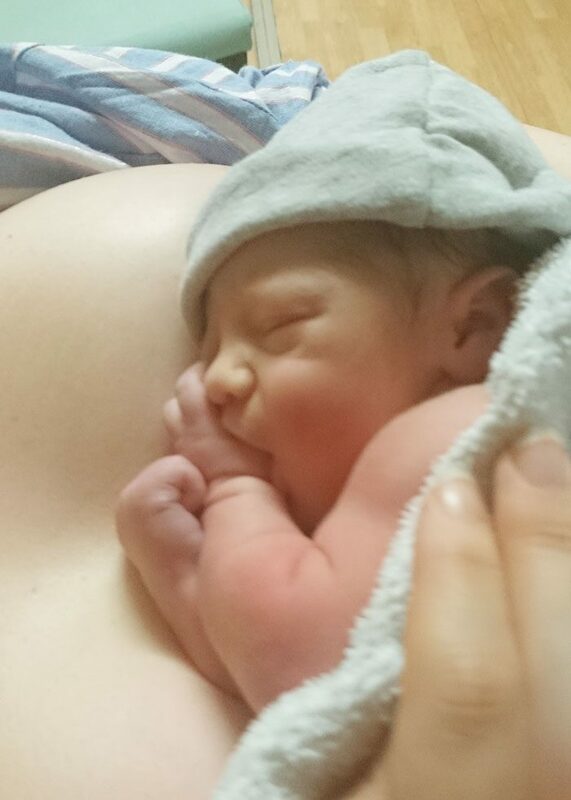 Then I had a shower, Fin was placed on a warm mattress and by 9pm we were in the post natal ward. He was checked out by a paediatrician and all was well apart from a couple of things due to his weight and age including his ability to maintain his temperature and blood sugar levels, however both came back as being perfectly fine. He also has tongue tie (which is were the tongue is attached to the lower mouth by a little piece of skin) a condition that can make breast feeding difficult. I have to say I was lucky to have some amazing midwifes and support staff in those first few hours, and what turned out to be days in the hospital. Committed to breast feeding we continued to try and get Finley to take my breast but he struggled. We hand pumped colostrum and fed him that via a syringe but the docs wanted him to take some formula as well, something I wasn’t happy about. I brought in my own organic formula and we cup fed him it so we still had a good shot at breast feeding. Another complication we encountered was his jaundice. His blood test results kept coming back under the line for treatment but then one test just touched the line and they decided we needed to do phototherapy which added another few days in hospital. It also made feeding harder as he was so sleepy. We kept doing skin to skin and 3 days after birth I was able to use an electric pump to express milk instead of using formula. About that time we had a breakthrough and he started breastfeeding! From day 4 to 6 after birth in hospital I was breastfeeding and expressing top ups to help get the jaundice out of his system. Now we are home its breastfeeding all the way which is fabulous. We have a referral for the tongue tie but that hasn’t stopped us! His weight went down a little after birth as is normal, but now it’s back up again which has given me more confidence in my breastfeeding skills. Those days in hospital were very hard. All I wanted to do was go home and us be a family, it was so hard for James to come home on his own each night and for me to be stuck in there. Add to that crazy out of wack hormones and I was pretty much an emotional wreck. I did have a few great midwives that helped me through it all, and now that I look back on it I actually think it was a good thing as it gave us the time we needed to get breastfeeding established and I was a lot more confident coming home on Friday after that. Another thing I’ve struggled with is coming to terms with having a pre term baby. I have no idea why he decided to come so soon, and I’ve asked every doctor and midwife why this might be but they have all said it’s just one of those things, baby either wanted to come early or my body has a shorter gestational period. I’ve also found it hard to transition from being pregnant to not pregnant, I think that’s something you get your head around in the last few weeks of pregnancy which I didn’t have. I kind of miss having my bump! The tiredness is also insane, I have no idea how I’m functioning right now to be honest. I am feeling better now I’m home, but in the hospital it was really bad and not made better by the fact that I spent almost 6 days in one room eating hospital food. I really enjoyed my green smoothie on Friday! Then it was on Thursday night, our last night in hospital, that it really hit me that I was now a mother. It’s an incredible thing to be totally responsible for another life and I do get freaked out by that, but then I remind myself to trust my instincts and that if others can manage this then so can I. I just love my little man so much, I didn’t know I had the capacity to feel so much love for another. James has also been incredible, he’s a natural dad and has been so helpful with everything. Now we are home it’s really hitting me how much life is going to change. We are just finding our feet as a family and establishing some kind of normality for us with our new baby. Thanks for letting me share that story with you, I find it really helps me get my head around it all when I recount it to people. I still can’t believe I was walking around town and driving while in labour just a few hours before giving birth and I’m so chuffed that I had a positive mostly natural birth experience considering the circumstances. I’m also pretty happy with my body post pregnancy. I’m sure I’ll blog more about that in coming weeks but it’s not half as bad as I was expecting. 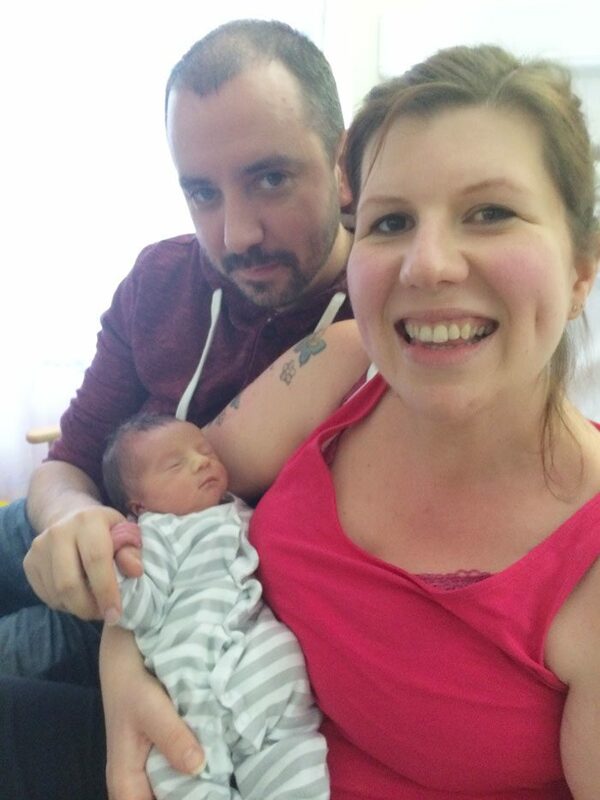 I know a few of you have commented on Finley’s name as well, it’s a bit random how we came up with that but it was while we were in Brighton back in May that we heard the name and both loved it. He’s just bloody gorgeous isn’t he! Anyone else with a pre term baby? How did you feel after giving birth? Who do you think he looks like most, me or James?